The world is quickly becoming one market. With the proliferation of cloud hosting, virtual offices and quick, affordable ways to validate ideas, there’s never been a better time to start a business. Globally minded entrepreneurs are on the rise. 99designs, the graphic design marketplace, exists to connect two such types of entrepreneurs: business owners and designers. The platform is simple. People looking for graphic design submit a brief to the community. Any designer, from Sydney to Serbia, can create a design concept in response. The client picks a winner and that designer earns money. The idea for this global marketplace was born in Melbourne, though its founders had eyes on expansion from the outset. They opened an office in San Francisco in 2010, built up the team, and went on to secure venture capital funding. In its early days, its primary goal was growing the US market. Until launching a localised Australian site in 2011, all customer transactions were conducted in US dollars. The company relied on word of mouth for new business and focused solely on building the best possible product and customer experience. In 2012, the company was well-positioned to execute a broad internationalisation strategy. 99designs has always boasted a global talent and client pool. On its own, for example, the dotcom domain has connected designers in 190 countries with customers in 150. So why push for localised content? First, 99designs is passionate about making it easy for businesses and designers to connect. Translating the site would remove yet another barrier for people living anywhere in the world to work together, communicating in the languages in which they’re most comfortable. Enabling local currency transactions would make the payment process run more smoothly. Next, the company sought to acquire new customers. While much of the global community does speak English, people who search for services online still tend to do so in their native language. Establishing a local domain and serving up relevant content would increase the chances of people seeking graphic design services to find 99designs. Third, a local presence would allow more meaningful connections to be made with customers through advertising and social channels. In short, having a local presence builds trust. Once that’s firmly in place, growth can continue organically. 99designs believes in the minimal viable product (MVP) strategy. When launching a new product, the company typically starts with a test. It directs traffic to the product, watches people interact with it, talks to customers and designers, learns and then iterates. When it came to internationalisation, the company took the same approach, and set out to determine what was needed in order to become a successful global platform. Basically, the company built a strategy that would keep its core experience in place while adjusting the customer-facing components. The MVP strategy allows start-ups to go global early. In order to identify what markets to enter, the company crunches the numbers: population, GDP, internet penetration, disposable income and propensity to spend. Another consideration is the vibrancy of the start-up scene. How do people there adapt to new technology, and how well is 99designs doing there already? Taking all of these factors into consideration, 99designs began mapping out the path to create a localised site in Germany, already one of its strongest markets outside of the US. support: providing phone, chat and email assistance. On the development side, 99designs began by localising everything but language. In particular, this meant region-appropriate content and currency. A six-month coding effort saw the team refactor its core PHP codebase to support local domains for Germany and numerous other target countries (eg. 99designs.de). Upon the launch of each new regional domain, users would be redirected to the new URL based on GeoIP look-ups. It was then time for 99designs to remove the language barrier for non- English speakers. The company partnered with Smartling – an agile, cloud-based translation platform – to get the first iteration of the German language site up and running. Recognising that language is intertwined with culture and that direct, word-for-word translations don’t always communicate the intended message, 99designs relied on local German wordsmiths to finalise the copy. As it has done with every country launch since, the company hired a German country manager to oversee the new site and communities. These managers essentially run a mini start-up, handling translations as well as marketing, public relations, SEO, SEM, events, outreach and more. The country manager also owns the site metrics. After launching each new MVP site, the team carefully watches the numbers and continues to build out what the market demands. 99designs relies on a brand style guide to bring consistent messaging to each market. The comprehensive document covers everything from fonts and Pantone colours to 99designs’ mission, value proposition and user personas. This means that, when translations of text are called for, country managers have a single point of reference for style, tone and brand personality. maintaining a consistent culture: a weekly call keeps everyone at 99designs on the same page, no matter where they are located. 99designs.de launched in September 2012 after nine months of intense work. Once that groundwork had been laid, subsequent launches came much more rapidly. The amount of new engineering work required decreased with each launch, enabling the team to focus on marketing, support and translation. 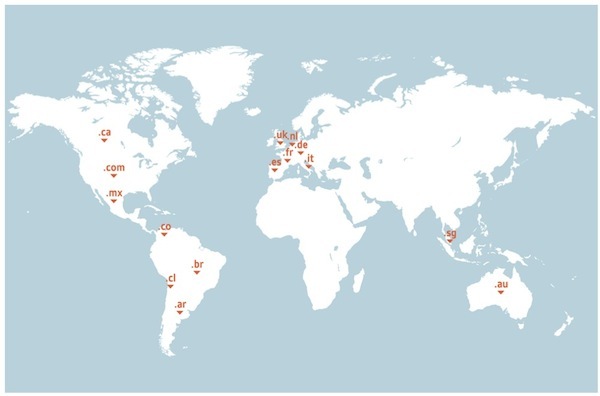 Within a year of the German site launch, users of 99designs could also access localised sites in French, Italian, Spanish, Dutch and Portuguese. 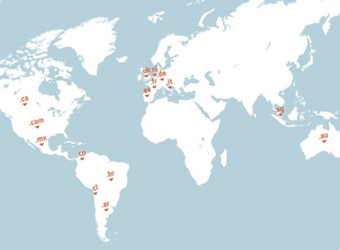 99designs now serves localised content to customers in 19 countries across seven languages. The minimum viable approach to internationalisation has proven a global success. In the year following the launch of the German site, 99designs’ customer base in Germany grew at a rate five times faster than that in the US. 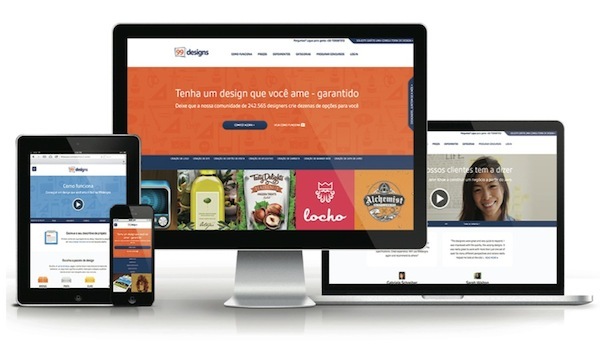 The August 2013 introduction of 99designs Portuguese language site in Brazil – the company’s most recent launch – has resulted in a growth rate 10 times that of the US. With its US market still thriving, in recent years the proportion of customers residing there has shifted from about 70% to 60%. Both sides of the vibrant global marketplace continue to grow. To date, the company has facilitated more than 280,000 design contests for businesses and has paid out $70 million to a network of over 280,000 designers.